This is a big weekend in Pondicherry and we are bringing in someone special to celebrate it! 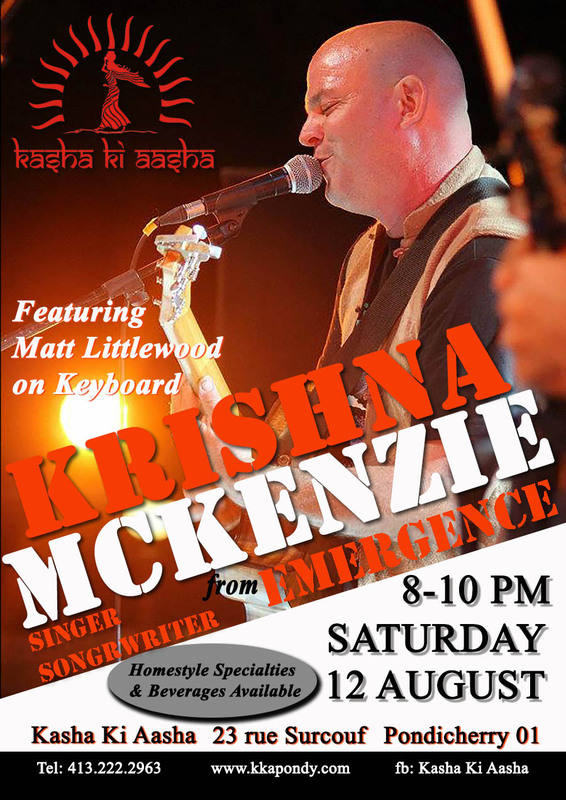 Krishna McKenzie, lead musician of the internationally touring band EMERGENCE will be on stage at Kasha Ki Aasha backed by the well known keyboardist, Matt Littlewood. Come enjoy Krishna’s Indie Pop style original compositions in just one more edition of the Purely Pondicherry Performance Series on Kasha Ki Aasha’s breezy terrace! It’s going to be another great evening full of great music, great food and great people! Music starts at 8 pm! Kasha Ki Aasha is at 23 rue Surcouf in Pondicherry – on the edge of the French Quarter. We take reservations, but only before 8 pm! Call us at 413 222 2963!